A Southern Twist: Pimento Cheese Sourdough! Submitted by a_warming_trend on March 30, 2015 – 4:05pm. This might be my favorite sourdough variation ever. Okay, maybe second to my Dark Chocolate Chunk endeavors. 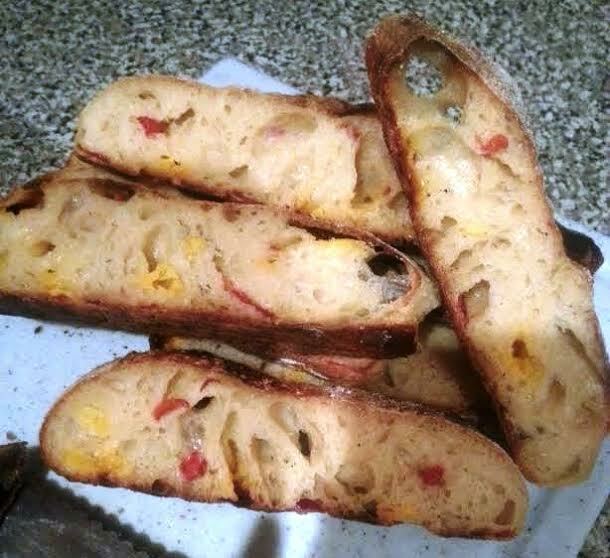 Anyhow, the red pepper and cheddar cheese compliment the tang of the sourdough so perfectly…and the slight sweetness of the white flour and malt…it’s good, y’all. It’s really good. The following is the formula I developed for one loaf. 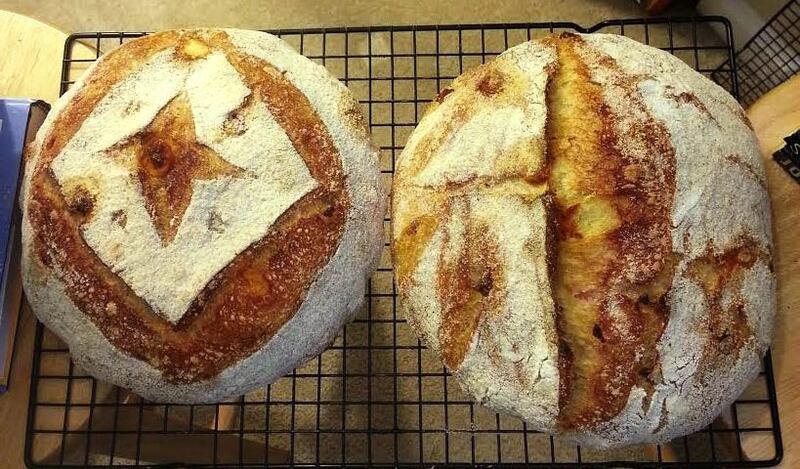 Note: I don’t have crumb pictures for the boule/batard…only from a ciabatta version I baked. The crumb for the boule/batard looked similar, but rose more with the 76% hydration given below. 1) Prepare your starter/levain however you like, such that it will be ready in 8-12 hours. 2) Mix flour and water in a large plastic bowl and autolyse for 8-12 hours (if you’re unable to do the super-long autolyse, you’ll be fine…it just develops the gluten and sweetness of the flour in such a nice way). 3) Add the levain, salt, malt, black pepper, red pepper, cheddar, and cream cheese, and squish through your fingers until incorporated (the technical term is the “pincer method,” but I have to be honest. I just squish!). Stretch and fold the dough over itself for an additional 3 to 4 minutes after mixing. 4) Stretch and fold the dough 4-16 times (1-4 full turns) at 30 minute intervals over the next 1.5 to 2 hours. Watch the dough to determine whether it needs three or four folding sessions. 5) Allow the dough to rest at room temperature for 2-4 hours after the last fold, or until increase roughly 80%. 6) At this point, you can either put the container in the refrigerator for 4-72 hours before shaping and proofing, or shape and proof immediately. 7) Shape into a boule or batard and proof in a brotform/banneton for between 2 and 3.5 hours at room temperature, or 30 minutes at room temperature and between 8 and 18 hours in the refrigerator. In any case, try to proof until 45-55% increased in size. 8) If you’ve shaped and proofed at room temperature, pop the loaf in the freezer for 20 minutes before releasing from the brotform. 9) Bake at 475 F for 18 minutes with steam, 20-25 minutes without.